The Friends of Craighouse have written to the Council urging immediate investigation after they discovered that five buildings at Craighouse were being considered for the Buildings At Risk Register (BARR). The Register, maintained by the Royal Commission on the Ancient and Historical Monuments of Scotland (RCAHMS) on behalf of Historic Scotland, provides information on properties of architectural or historic merit throughout the country that are considered to be at risk. Within 24 hours of our phonecall to the RCAHMS to ascertain what was going on, the buildings appeared on the At Risk register despite having been told they were to be put on in a few weeks time. You can view them on the register here. We have also found out that it was the Partnership themselves in the guise of frontman, William Gray Muir of Sundial Properties, who asked for the site to be considered for the register. The Friends question how these buildings could end up on the Buildings at Risk Register considering the buildings were in good condition when the Partnership took them on. They were also deemed in good condition in the Simpson and Brown Conservation Audit in 2009. Is this an attempt by the developers to try and force the Council to accept the Partnership’s excessive and unjustifiable plans to put new-build across some of the most beautiful and protected parts of the landscape? It certainly does not engender confidence in this Consortium’s future vision, if they are unable to adequately maintain the buildings now, before the planning application even goes in. The Friends have written a letter to Edinburgh Council Planning Department, calling for the Council to investigate the situation and, if necessary, use their statutory powers to force the Partnership to look after the site properly to safeguard the buildings. Buildings of National Significance left to (dry) rot? The Craighouse Partnership has been talking about dry rot at the site since last November. We want to know what has been done about the problem since then. Sundial advertise themselves as “…leaders in the restoration and development of inspirational and historically-important residential properties in Edinburgh”. MoREOF is putatively of circa £300m in size. In light of this, one would have thought that taking such length of time to tackle problems that need to be dealt with as soon as possible is a significant delay. Edinburgh Napier University has an annual income of around £110million. MoREOF is putatively worth some £300million. Should it not be questioned why a consortium of such resources can allow such an important piece of Scottish heritage to be threatened? Despite a letter to Dame Joan Stringer, Principal of Napier, and a FOI letter to Napier to find out what remedial works have been undertaken and what is being done to make sure the Partnership (of which Napier are a part) comply with their obligations to maintain the site, William Gray Muir has continued to talk of dry rot and threaten dereliction over recent months. In fact, our letter details seven references made by William Gray Muir to the dry rot in the press. Community groups were even given a tour of areas of dry rot – in the manner of a dry rot showroom – on the Community Liaison Forum site tour in March, some four months after the initial report. Shown photographs of dry rot in South Craig at the first Community Liaison Forum meeting, William Gray Muir was asked in the meeting of 28th March what was being done about it. He told us that work was “already underway” (recorded in the note of the meeting). So how come the Buildings At Risk Register inspection a month later still report “extensive” dry rot in South Craig? And why would William Gray Muir invite the RCAHMS to assess the buildings for the Buildings at Risk Register? Surely, if repairs were underway then the buildings would not be at risk? The big questions is: How can The Craighouse Partnership be entrusted with the future of one of Edinburgh’s most sensitive and important sites, if they are unable to undertake expected maintenance such as sorting out dry rot and unblocking guttering? How Can the Craighouse Partnership be Trusted with this key piece of Scotland’s Heritage? This is the fourth site associated with a member of The Craighouse Partnership to end up on the Buildings At Risk Register. Yes, you read that correctly – the fourth site. Key people in Mountgrange leave in their wake two historic buildings – the Canongate Venture and the Macrae Tenements – now on the Buildings at Risk register, after the disastrous Caltongate fiasco left a huge gap site and empty buildings in the Old Town, and £70m owed to the Bank of Scotland (of which only a tiny fraction has been recovered). This is the second major development of listed buildings associated with William Gray Muir of Sundial Properties, to end up on the register. 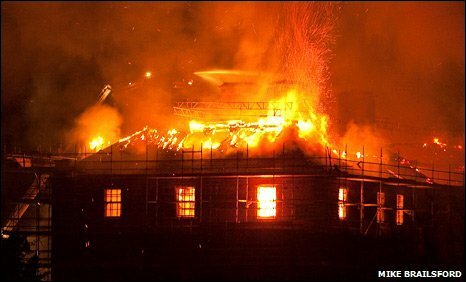 He became a board member of Edinburgh World Heritage in 2010, while only a year earlier his only other attempt at “enabling development” – Leslie House in Fife – was gutted by fire in 2009. Full planning consent for the conversion of the listed building and new-build development in the grounds had been granted. 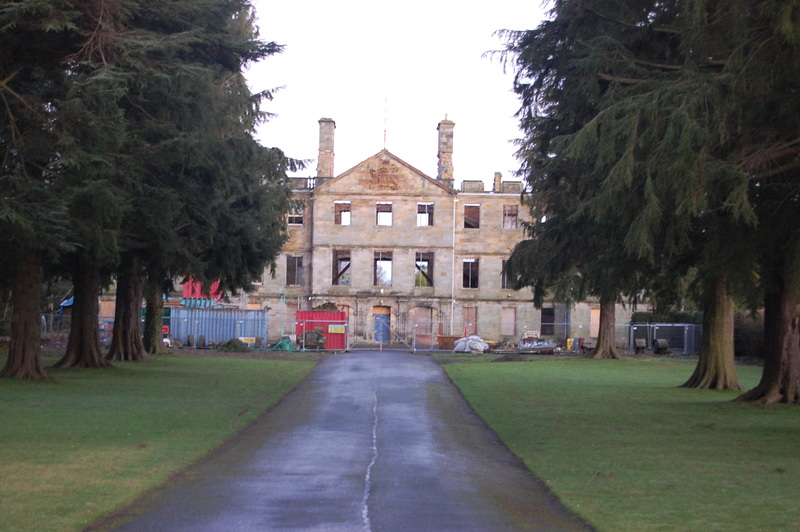 Leslie House remains a gutted shell. Is it appropriate for William Gray Muir to be a board member on Edinburgh World Heritage when he himself has failed so spectacularly to protect key parts of Scotland’s heritage? 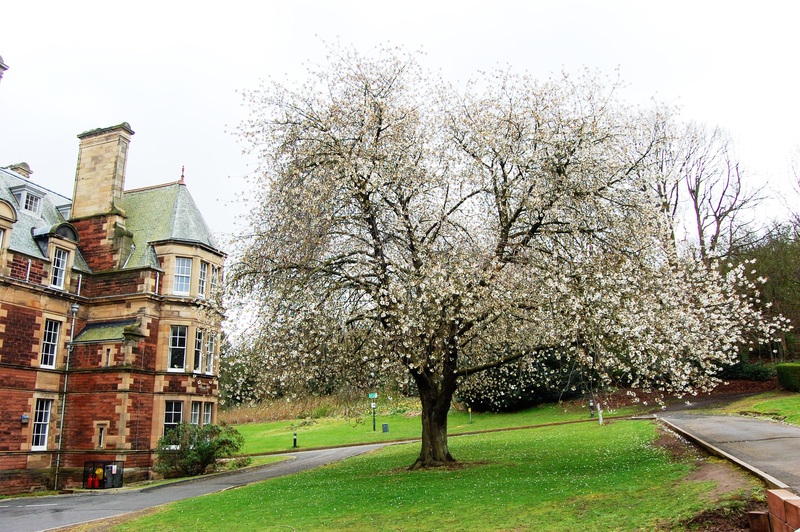 Surprisingly, Edinburgh World Heritage – who are funded heavily from the public purse – have made no comment on the proposals, despite Craighouse containing key views in to the heritage site and being one of Edinburgh’s seven hills and part of the unique character of the city. Napier, however, have chosen to remain silent on the matter. An FOI requesting further information about the dry rot resulted in no information from the University that, as joint partner in this planning process, are set to benefit financially to the tune of about £1.5million according to Joan Stringer from the development which sees 182 new residences created – 116 of which will be luxury houses and apartments built across protected land of Great Landscape Value. Yesterday, less than a month after releasing a press statement making accusations of an “emotive disinformation campaign”, Dame Joan Stringer announces to the press that she is to stand down as Principal. In a statement to the Evening News, she specifically denies this decision was prompted by the controversy surrounding the Craighouse development. The Friends don’t believe that questioning the lack of documentation and evidence of adherence to due process is “emotive”: but is to do with the propriety and probity that is a mandatory requirement for such publicly funded institutions. It is in the public interest to understand how Napier, a public institution, made its decision to sell to Mountgrange and so, we continue to urge her to release all the documentation that Napier holds concerning the tender process for this multi-million pound deal which would explain precisely why Mountgrange won the bid for this sensitive historic site. It is paramount that the planners and the local community stand firm. It would make a mockery of the entire system if the Craighouse Partnership are granted excessive new-build whilst their own buildings are allowed to deteriorate in this way. Granting consent to build on this beautiful and highly protected site would set a truly dangerous precedent – something that cannot be under-estimated – and would put innumerable green spaces and historic buildings under potential threat . If we care about the city’s heritage we must stand firm and demand The Craighouse Partnership treat Craighouse with the respect it deserves. They must maintain the site properly and produce reasonable plans. Or do the honourable thing and sell it to someone who will. It has come to our attention that some of the grade-A listed buildings at the Craighouse estate  may be falling into a state of disrepair. The current leaseholder of the estate appears to be Edinburgh Napier University and the owners appear to be Craighouse Ltd (Isle of Man) which is in turn owned by the MoREOF fund administered by Mountgrange Investment Management LLP. A development consortium, The Craighouse Partnership, has lodged pre-consultation process with your department as a prelude to a full planning application; the consortium comprises Edinburgh Napier University, Mountgrange and Sundial Properties. On or around November 2011, The Craighouse Partnership intimated on their website that wet-rot was discovered in Bevan House and both wet-rot and dry-rot had been discovered in South Craig. During a site visit on the 14th March 2012, we were shown examples of dry-rot damage to one of the villas by Heneage Stevenson of Mountgrange and William Gray-Muir of Sundial. In a document prepared by The Craighouse Partnership to present at the Community Liason Forum dated 14th March 2012, there are outlined similar problems of dry-rot and wet-rot in South Craig, a major wet-rot problem in Bevan House and rising damp in East Hospital. In an Edinburgh Evening News article published on Wednesday 28th March 2012, William Gray-Muir of Sundial has been quoted as saying “Some of them that were vacated last year are already suffering from dry rot. Others could go into rapid decline”. The issue of dry-rot is raised again in the Community Laison Forum minutes of Wednesday 28th March 2012. In an article in the Edinburgh Evening News published on Thursday 24 May 2012, William Gray-Muir is quoted as saying, “…[the buildings] are already being affected by dry rot because they’re lying empty”. Furthermore, there is a page on The Craighouse Partnership‘s website which shows the apparent repairs to the rot damage. By inspecting the metadata, one can determine that the last update to the page was on the 24th April 2012 with the photographs shown having been taken at an earlier point in time, on the 27th February 2012. Sundial advertise themselves as “…leaders in the restoration and development of inspirational and historically-important residential properties in Edinburgh”. MoREOF is putatively of circa £300m in size. In light of this, one would have thought that taking such length of time to remedy problems which are – at this early stage – easily fixed, is a significant delay. With due consideration to the situation, we ask the Planning Department at the City of Edinburgh Council to undertake any necessary investigations and enquiries to determine the current condition of the buildings at the Craighouse estate. In the event that the buildings are indeed falling into a state of disrepair we trust that the Planning Department to undertake whatever action is required to properly preserve the buildings, if necessary up to and including exercise of any relevant powers conferred by Part I Chapter V of the Planning (Listed Buildings and Conservation Areas) (Scotland) Act 1997.
that i want enjoyment, for the reason that this this website conations in fact fastidious funny stuff too.